The November 4, 2014 Gubernatorial General Election brought many election changes – extended hours for early voting; early voting on the Sunday before the election; expanded grace period registration and voting; Election Day registration; and electronic pollbooks in all precincts. Voting before Election Day set records, with more mail ballots being cast than ever before and a 68.5 percent increase in pre-election day voting. The Nov. 4 election also featured one of the closest elections in Illinois history, the state treasurer’s race. That close contest was not decided until two weeks after the election, when all legally late-arriving mail ballots and valid provisional votes were counted – truly demonstrating how every vote counts. • Voting before Election Day – by mail or during early voting and grace period voting – grew to more than 26 percent this election, up from 15.4 percent in 2010. 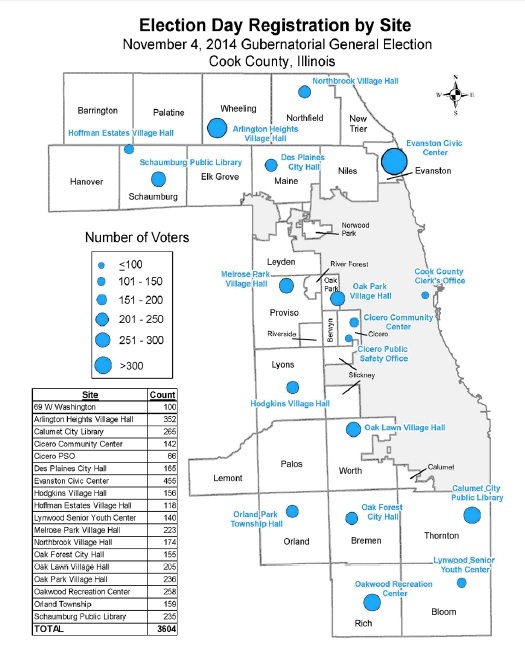 • The 51,237 mail ballots cast exceeded all previous elections in suburban Cook County, with twice as many as in 2010. • Turnout reached 49.8 percent, down from 52.5 percent in 2010 (nearly matching the 2006 turnout of 49.7 percent). • More women than men voted – 54.2 percent vs. 45.8 percent – and voters 65 and older made up about one-third of all voters. • Voters of all ages used Election Day registration, but voters ages 18-34 made up nearly half of participants. This report is a masterclass in what is possible when an election office has the ability to collect and analyze data about its operations. Thanks to David Orr and the Cook County team for preparing and sharing it with the field! Be the first to comment on "Cook County Post-Election Report Examines Turnout, Details Impact of New Laws"